In preparation for this month’s System Principal Meeting all of us have been asked to write a short description, from our perspective as administrators, of what teacher learning, administrator learning or student learning has happened in our school and the reasons why there was success during the 2012-13 school year. This short description of learning will describe what has happened in our school and the factors we believe led to success in this area. 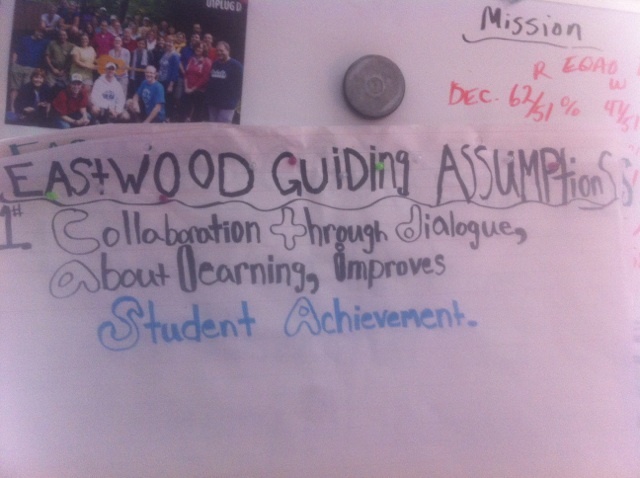 I believe that one of the many successes at Eastwood this year was the creation and adoption, and continuous referral and refinement, of the 4 Eastwood Guiding Assumptions. I also believe that this success is a reason for further success with our professional learning cycle. Specifically the time that we spend together in dialogue around student learning and our own learning. These assumptions are shared before TIME meetings, PLC meetings and Staff Learning Sessions. 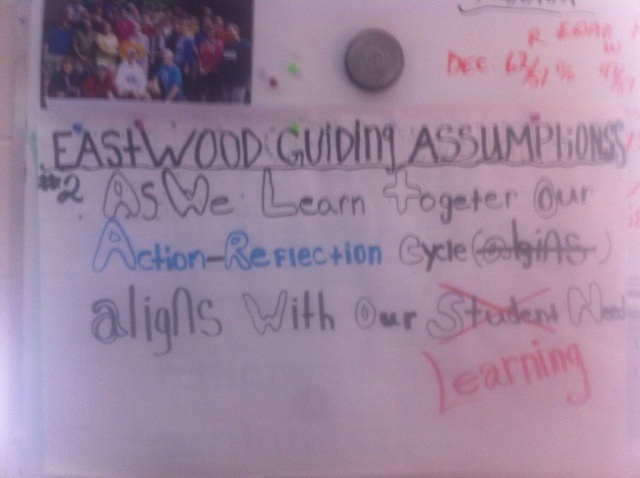 We have used these assumptions all year to frame our time and learning work together. The evidence I might provide for this is more a qualitative analysis and description of the work that happens when 5-6 teachers at Eastwood gather to learn. -Kindergarten students are blogging for their parent audience. -teams of teachers discuss problems of practise with the instructional coach and engage in action/reflection. -parent reading and learning partners are in school everyday in grades EY to 2. -the learning commons is a vibrant place to learn, inquire and play. -teachers mock the Principal’s endless reference to our school wide learning goals! The list could go on. These are just a number of examples of the fruits of our work together that is specifically related to professional learning time tied to teacher, student and administrator learning. If I were to look more precisely at any one of these examples I could see all 4 assumptions at work during the process of getting from point A to point B and back again. #1 Collaboration through dialogue, about learning, improves student achievement. #2 As we learn together our action-reflection cycle aligns with our learning needs. 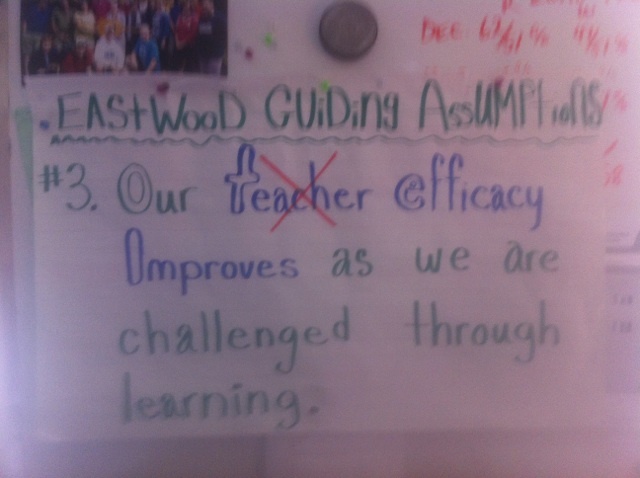 #3 Our efficacy improves as we are challenged through learning. 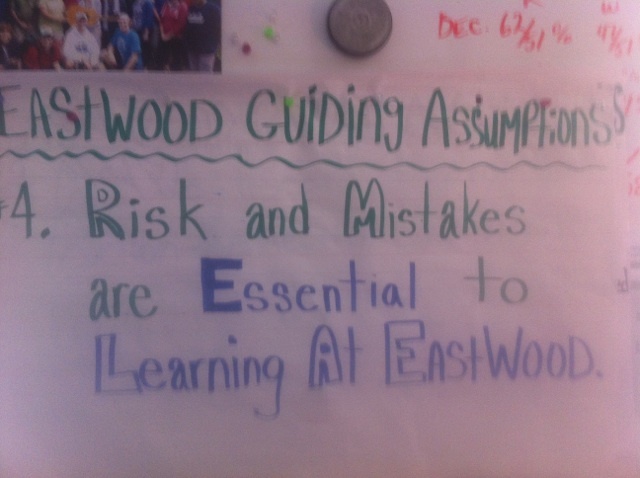 #4 Risk and Mistakes are essential to learning at Eastwood. Once again our neighbours to the North are offering up #edCampDetroit to support teacher professional learning around technology integration into curriculum. You may wish to share this info with any interested staff: http://edcampdetroit.org. There are already a dozen or so eds from our area/district attending. The cost is $0, the learning is organic, location and weather have always been great and the after glow gathering is a great place to meet other passionate educators! Hope to see you there on Saturday May 4th, 2013 at Wayne State University’s College of Education.